The Tyne class lifeboat City of Sheffield is acknowledged as being the first fast slipway lifeboat although they were still able to be kept afloat at some RNLI stations. 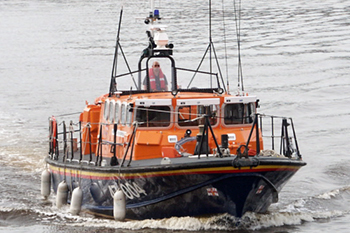 The last Teesmouth lifeboat was a Tyne class lifeboat which was kept in a dedicated house. I have added photographs of the "City of Sheffield" as well as relief offshore Tyne class lifeboats. The lifeboat purchase cost of £560.000 was met from the "City of Sheffield" lifeboat appeal which raised £420,000 in its 18 month duration, with the bequest of Mrs. Mary Mable Walker along with other gifts and legacies. The on station lifeboat was launched 239 times saving 88 lives, whilst the relief lifeboats were launched 34 times saving 8 lives in the process. At Whitby the "City of Sheffield" replaced a 44 foot Waveney Class "The White Rose of Yorkshire", taking up station at Whitby in November 1988, after being officially named on the 28th July 1989 by H.R.H. The Duchess of Kent. We have owned a number of small fast boats which were used for dive trips and the occasional fishing trip, both during the day as well as night time. We used the slipway next to the Teesmouth station and over time we enjoyed a good relationship with its crew. On one occasion I was permitted to be in the lifeboat house when the lifeboat was being launched on exercise. 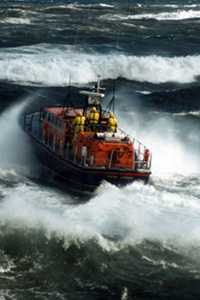 It was a wonderful experience, I always found the deep roar of the lifeboat engines quite exhilarating. As the slack was taken up on the securing line I felt the hairs on my neck tingle in anticipation, especially as the launching team removed the chains actually holding the lifeboat secure. It was then only a matter of waiting for the coxswain to signal his readiness before the hammer was brought down on the launching pin, although it seemed to take a long time it was only a matter of a few minutes. 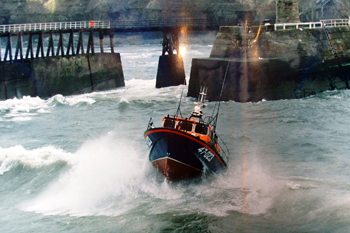 The all weather lifeboat slid down the slipway increasing speed as it went, having seen the lifeboat launched from our boat as it was a good opportunity to be inside the lifeboat house as it was launched. As one of the committee members for the small boat club and a supporter of the Teesmouth lifeboat I extremely lucky enough to be invited onboard on an exercise launch. Sat strapped into one of the crew chairs inside the wheelhouse it was a moment to savour and one that I will never forget. The roar of the engines increased just prior to the pin being released and in no time at all the boat was out of the lifeboat house speeding down the slipway. As it hit the water the windows were covered in gulf of water, yet in no time at all the lifeboat had recovered and was climbing onto the plane. With the low roof of the lifeboat house the radio / radar mast was kept lowered but I was always amazed at how quickly the crew were in getting it raised and locked in place. The speed at which the lifeboat left the lifeboat house was exhilarating and it must have been a buzz for the crew. 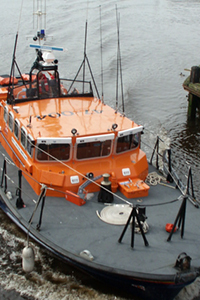 The lifeboat featured a low profile wheelhouse and a separate cabin behind the upper steering position. 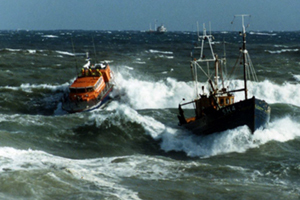 The lifeboat was equipped with substantial bilge keels to protect its propellers. The last Tyne was built in 1990 and the class was gradually being phased out, replaced by the Tamar class. 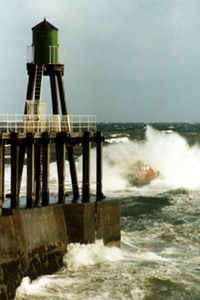 The following selection of photographs show the type of extreme conditions faced by the Whitby crew when it had its Tyne class lifeboat. 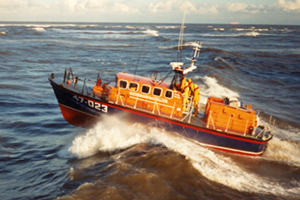 I have quite a few photographs from when we had our own boats and some really good images of the the Teesmouth lifeboat. I am going to add them when time permits. 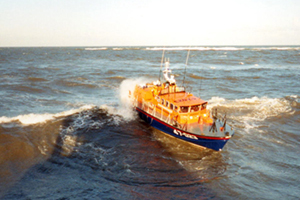 I was as shocked as anyone to learn the RNLI was going to close the station in 2006 as it is accepted that the Teesmouth lifeboat station was one of the few on the North East coast which is guaranteed to always be able to launch and return to station. The decision to close to the station seemed almost unbelievable and in many ways fundamentally flawed and a day which left everyone baffled. The area is awash with ships and boats of all sizes, both professional and pleasure, the River Tees also has the busiest maritime industry on this coast with one of the biggest cargo facilities in Britain. It seems bizarre then that the RNLI would withdraw a lifeboat that covered the area. We only recently took a trip down past the station and it was quite sad to see the lifeboat house and station unoccupied. It is the newest building along the whole stretch of the "South Gare" and it is doubtful that any use could be found for the station let alone the defunct shed, a clear shame. As soon as news of the station closure was announced there has been a proactive support network called the "Teesmouth Lifeboat Supporters Association" who worked tirelessly to build support for the station and even had the support of the local council and many maritime professionals. Today the station lies unused and silent. 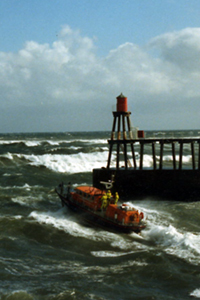 The following link opens a new page with a selection of good quality photographs from Paul Waugh related to the former Teesmouth lifeboat. I have a copy of a video from the last ever launch of the Teesmouth lifeboat, which I aim to add when I obtain permission. 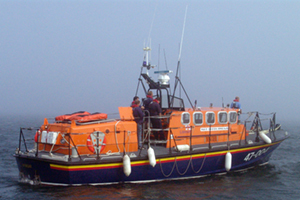 The "City of Sheffield" was stationed at Whitby from 1988 through to 1996 to be replaced by a 14 metre 'Trent' class lifeboat. She served as temporary station boat at Ramsgate before a brief period in the Relief Fleet. 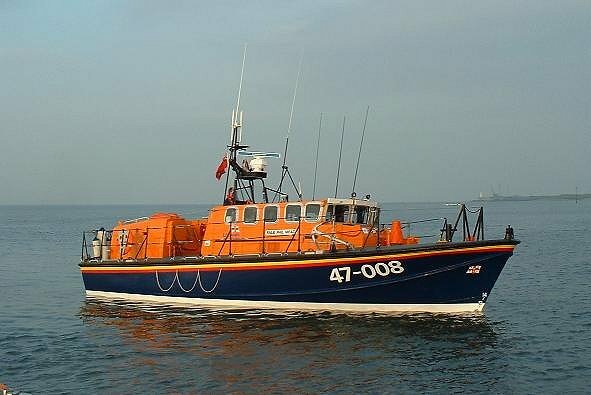 Afterwards the lifeboat was chosen as one of the Tyne's to be re-fitted with DDEC engines and relocated to Hartlepool Lifeboat Station, although not before fleet wide problems with these engines prevented her taking up station duties.